The most effective way to prevent rats from becoming established on your property, or to control and eliminate them once they are established, is through the implementation of what’s known as an integrated pest management control program. Basically, this refers to the removal of food, water, and nesting (harborage) areas; the use of suppression (poison baits and traps); and building them out to prevent rats from entering homes, buildings, and other structures. If you are unsure of what steps to take, or if you think the infestation is beyond what you can effectively handle, you may want to hire a certified pest control company to provide this service. Integrated Pest Management (IPM) is the decision-making process for managing pests that reduces the amount of health and environmental risks. The measures mentioned above; sanitation, exclusion, and trapping with mechanical traps like snap traps are examples of IPM. Identifying the pest, developing an appropriate strategy, and limiting the use of poison such as anti-coagulant baits when practical is more effective and safer for children, pets, and wildlife. In fact, the County of Ventura has successfully implemented its own IPM Program. With a goal of utilizing the most environmentally sensitive approach possible to both plant and pest management, we have reduced the application of pesticides and poisons. Many people think the use of poison baits or traps are the best methods to control or eliminate rats on their property, or in their homes and other structures. While these methods are relatively easy to use and they can have an immediate impact on the rat population, these methods alone are not enough to prevent rats from becoming established. The most effective and long term solution to preventing and controlling rats is through the implementation of an IPM program. With this approach, before it is necessary to or in addition to reducing the rat population through the use of poison bait and traps; potential food and water sources are eliminated, nesting areas and other rat harborage conditions are reduced or eliminated, and repairs to holes, cracks, and gaps around building foundations, doors, walls, pipes and wires are made to prevent the rats from entering the structure. The term domestic rats generally refers to the species of rats that are typically found living in and around urban areas. 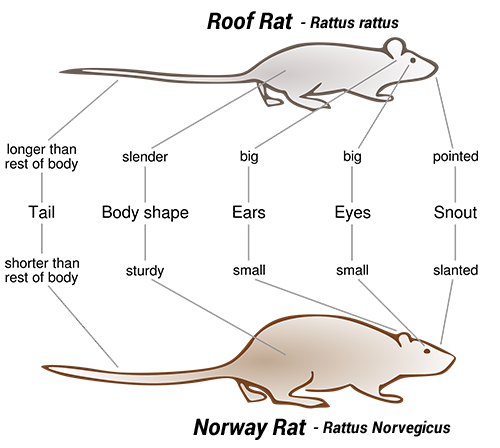 Two of the most common domestic rats found in Ventura County are the roof rat (Rattus rattus) and the Norway rat (Rattus norvegicus). 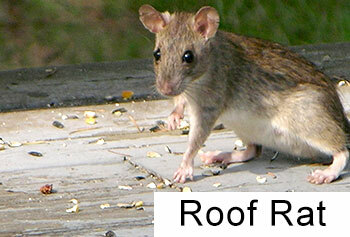 The roof rat is slightly smaller than a Norway rat, ranging from 5 to 10 ounces. They have a slender body, pointed snout, and a tail that is longer than its head and body. Body color can vary but the belly generally appears lighter, ranging from gray to white. The ears are large enough that they reach the eyes if folded over. They are agile climbers and usually live and nest above ground in shrubs, trees, and dense vegetation such as ivy. In buildings, they nest in enclosed or elevated spaces such as attics, walls, false ceilings, and cabinets. They are primarily nocturnal; normally becoming active around dusk, when they begin to seek food and water. When rat populations are high, some individuals may be active during daylight. In tropical or semitropical areas breeding may occur year-round but usually peaks in the spring and fall. Typically, 3 or more litters are produced annually. Gestation lasts about 3 weeks and 5 to 8 young are born in a litter. Young rats continue to nurse until 4 or 5 weeks old and generally cannot be trapped until about 1 month old. 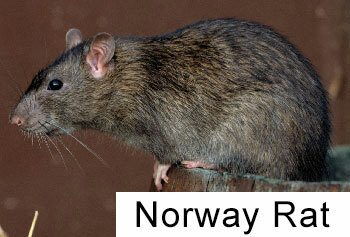 By comparison, a Norway rat is larger and more robust with a thick, scaly tail, dark above and pale below, that is shorter than its body length, and a more blunt snout. Body weight ranges from 7 to 18 ounces. Their fur is coarse and usually brownish or reddish gray above and whitish gray on the belly. Blackish individuals can occur. These rats live in burrows along building foundations, under woodpiles or rubbish, and in and around gardens and fields. Inside buildings, they usually remain in basements or on the ground floor. They feed on a variety of items such as grains, meats and fish, nuts, and some types of fruit. Norway rats are not as common in Ventura County as the roof rat. Rats eat and contaminate food, create problems by gnawing on electrical wires and all sorts of materials, and can transmit diseases to humans. Rats are nocturnal, furtive, and rarely seen but they leave signs of their presence. Look for discoloration or rub marks near entry points or along travel routes caused by oils and dirt on their fur. Gnaw marks left by rats can be seen materials including wood, PVC pipes, and wiring. Droppings may be seen, especially around food sources like pet food or in recycling containers. Caches of empty garden snail shells, hollowed out citrus rinds, and gnawed avocados are telltale signs of the presence of rats. 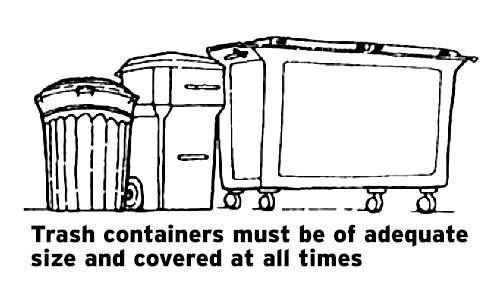 Keep garbage stored in tightly covered containers that are large enough to securely contain all of the trash; keep container lids closed when not in use. Keep entire premises clean and free of litter and debris. Feed pets during the day; bring pet food and water bowls indoors at night; store pet food in rodent proof containers. Bird feeders should be brought in at night. Any bird seed on the ground should be cleaned up daily. Harvest fruits and nuts as they ripen or mature to prevent them from becoming a food source for rats. Citrus and avocado trees are especially vulnerable to rats and should be harvested in a timely manner, and fallen fruit should be picked up daily. Prune shrubs, vines, and trees away from buildings, fences, and other trees. Stack piles of lumber, boxes, etc., at least 18 inches above ground and 12 inches from walls. Reduce any potential harborage and limit travel routes that may be used by rodents. Plug all holes in exterior walls. Use materials that will resist rodent gnawing; concrete mortar, galvanized sheet metal, steel wool. Use heavy gauge 1⁄4 inch hardware cloth to tightly cover all vents, particularly sewer vent pipes on top to the house. Make sure exterior doors are tight fitting and weatherproofed at the bottom. Trapping is the safest and most effective method for reducing the number of rats in and around homes, garages, and other structures. Wooden snap traps, with the bait secured to the treadle with string or fine wire, should be placed along walls and other runways at right angles, and secured with wire or strong cord. One must use caution and follow product label instructions when using poison baits, such as anticoagulants. Misuse can result in unintended harm to children, pets, and wildlife. Consider using poison baits only if necessary to control high numbers of rodents around the outside of a building. If there is a continuous re-infestation from surrounding areas, sanitation, exclusion, and trapping may not achieve adequate rodent control. Prior to incorporating poisoned baits into your rodent control effort, IPM methods should be implemented first. Hiring a licensed pest control applicator that is trained in the safe use of rodenticides may help to ensure that children, pets, and wildlife are not harmed inadvertently. Carcasses should always be removed and properly disposed of as soon as possible. Rat Facts - Did you know? 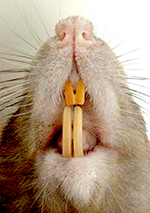 The front teeth of rats grow continuously; they must constantly gnaw on things to keep these teeth ground down. Rat’s bodies are flexible. They only need an opening ½ inch in diameter to enter a structure. Rats can jump 3 feet vertically and 4 feet horizontally. A female rat can give birth to over 25 offspring per year. Rats tend to avoid new objects placed in their environment. Rats can climb brick and other vertical surfaces. Rats can walk on telephone wires to gain access to roofs and upper stories of buildings. Rats can chew through adobe brick, cinder block, lead and aluminum sheeting, dry wall, and stucco. Algerian Ivy (Hedera canariensis) and Bamboo (Bambusa spp) are examples of plant species which harbor roof rats. Wherever possible these plants should be replaced with species which achieve the desirable effects but will not contribute to the rat problem. Plants should be low growing, not more than 10 inches in height. They should not be climbers. Fruiting plants should not be used. Plants should provide soil stabilization. Plants should require a minimum amount of water once established. For assistance with potential harborage, your City or County Code Enforcement office may be able to provide assistance.